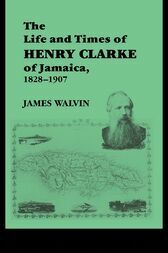 When Henry Clarke died in 1907 his obituary described him as an Englishman, yet he had only spent the first 19 years of his life in England, the next 60 being spent in Jamaica. He was a teacher, a cleric politician, a businessman, an inventor, and the father of eleven children. He left behind an extraordinary amount of writing, including a six volume diary upon which this biography is based.